Completed in 1941, the International Style structure fronting on Park Avenue was designed by Shreve, Lamb & Harmon, the architects of the Empire State Building, with Harrison & Fouilhoux, associated architects. The building is part of larger complex that includes the full block between Park and Lexington Avenue as well as a building on the southeast corner of Lexington Avenue and 68th Streets. Hunter College began as the Norman College for Women in 1868 and was renamed in 1914 for Thomas Hunter who had been president of the college for teachers for many years. The original Gothic Revival structures on this site were destroyed in a fire in 1936, but the handsome old building at 930 Lexington Avenue has survived. It was built in 1913 and designed by C. B. J. Snyder and served for a while as the Hunter College High School that was part of the city's public school system and enrolled girls from all over the city based on competitive examinations before it moved to the former I. S. 29 school building on Park Avenue between 94th and 95th Streets, which is now co-ed. In their wonderful book, "The A.I.A. Guide to New York City, Fourth Edition" (Three Rivers Press, 2000), Elliot Willensky and Norval write wrote of the old building that it was "The last gasp of John Ruskin's ghost here housed quality education in an 'English Gothic' shell." 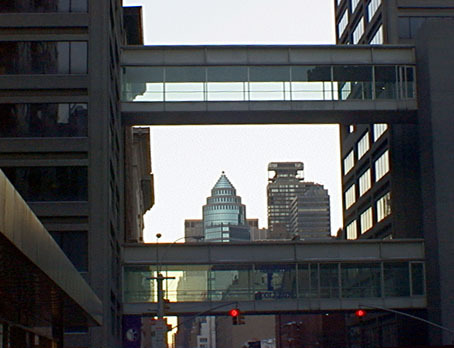 In a major expansion completed in 1986, Ulrich Franzen & Associates designed two new buildings for the college across Lexington Avenue from one another and connected by two skywalks. Surprisingly, the skywalks elicited little controversy at the time although they were the first to cross a major avenue. Although they afforded significantly improved circulation for the college, they obstructed major vistas up and down the avenue. The building on the southwest corner has a large plaza with a subway entrance and another skywalk that connects to the college's midblock building across 58th street. The Franzen buildings are industrial-looking and not attractive and completely out-of-context with their surroundings, which is a great shame since the older college buildings here are attractive. Skywalks are not bad per se but are inexcusable here. "Respendlent, beautifully detailed Modern blocks, they are welcome additions to the cityscape. 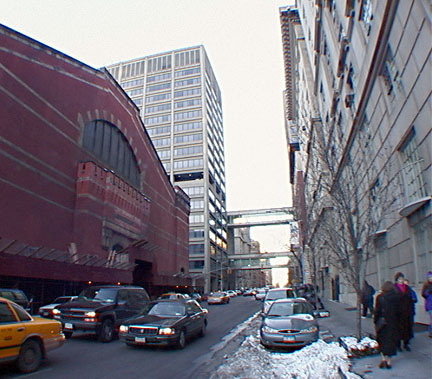 The enclosed glossy overpasses on the 3rd and 8th floors over Lexington Avenue, and the lower connection over 68th Street to old Hunter High, are unique and provide syncopation to the city's endless street vistas." The Park Avenue building is a bit bland, but it is crisply elegant with large, multipaned windows. It is set back only 10 feet from the building line and was the first building on the avenue since St. Bartholomew's Episcopal Church to be set back although subsequently a few others have been. It has high visibility on the avenue because of the low-rise front of the apartment building across 68th Street at 655 Park Avenue and the low-rise Union Club across 69th Street. "Shreve, Lamb Harmon's unadorned structure, one of the earliest Modern public buildings in New York, was controversial, prompting an Architectural Forum critic to write in 1940 that 'the more sentimental section of the public and profession decrythe omission of the customary collegiate [i.e. Gothic] trimmings.'"